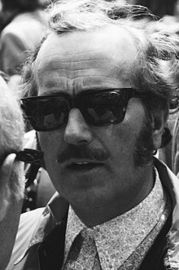 Anthony Colin Bruce Chapman, CBE was an influential English design engineer, inventor, and builder in the automotive industry, and founder of Lotus Cars. In 1952 he founded the sports car company Lotus Cars. Chapman initially ran Lotus in his spare time, assisted by a group of enthusiasts. His knowledge of the latest aeronautical engineering techniques would prove vital towards achieving the major automotive technical advances he is remembered for. His design philosophy focused on cars with light weight and fine handling instead of bulking up on horsepower and spring rates, which he famously summarised as "Adding power makes you faster on the straights. Subtracting weight makes you faster everywhere."